This maple wood grain bar molding, also known as Chicago bar rail, gives your guests a spot for arm support. It also adds the great look of a finished perimeter around your bar. This bar arm rest is made of hard maple wood lumber. Known for its fine, consistent look and durability to stand up to many years of heavy use, hard maple wood is a popular choice for furniture, floors, and cabinets. Choose the length of bar top rail that fits the dimensions of your bar, with a variety of sizes available between 2-feet and 8-feet. We recommend having some excess length when ordering this bar trim, as this will allow extra room for cuts, or any errors that may occur. 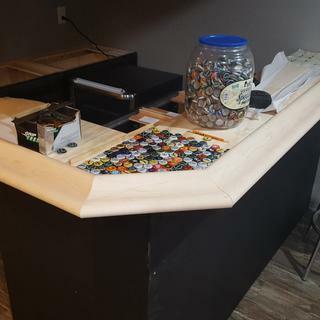 For more information on the different types of wood offered, as well as installation instructions, refer to our blog post about adding this wooden perimeter to your bar. Chicago style bar rail adds a completed look to the top of your bar, helps you prevent against unwanted spills, and gives your guests a spot to rest their arms whether they're standing or sitting. For a fully professional look, add 90-degree corners to match the curvature of your bar, or bar edge end caps to match this maple wood finish. Note: All bar rails come unstained, ready to stain or seal. International Shipping: Due to international shipping restrictions, we are unable to ship 8 foot arm rest molding to international customers. Excellent quality millwork. Was absolutely straight, with nearly perfect graining, and no checks, whorls, knots etc. required almost no final sanding, and profile was very consistent from one piece to the next. Highly recommend! Shipped in 8-foot segments. Beautiful and strong. Love it! I ordered a 2ft section since they don't have samples. It's nice but I can't justify the price to use on entire bar. There are other similar on line for less. I built a bar and liked the looks of this bar rali.